Honda workers were sticking to their demand for a pay rise of 800 yuan (117 dollars) a month but the company was offering 366 yuan. The employees earn around 1,500 yuan per month including overtime pay, a company spokesman said. In an open letter published in the business magazine Caixing the workers said they would continue the strike if the company's response was not satisfactory. They were also demanding that no striker is fired. "We are not striking for the 1,800 employees but looking after the interests of all workers in the whole country. We want to set a good example of how their rights are protected," the workers said. Employees criticized the official unions that were working to end the strike. They demanded the investigation of a case in which union representatives beat up some strikers. The Honda strike is the most prominent example of a growing number of disputes over higher wages in China. South Korean car maker Hyundai Motor Co had to give more money to staff at a parts facility in Beijing to end a two-day strike in May. The strike at an auto parts facility in Beijing belonging to a supplier of Beijing Hyundai was reportedly resolved quickly with Beijing Hyundai's input. 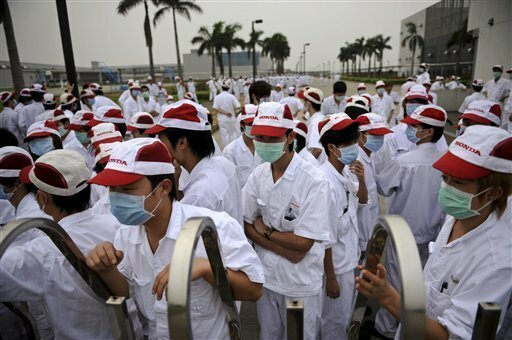 Around 1,000 workers at the parts factory started striking Friday afternoon, the Beijing Times reported Sunday. They returned to work late Saturday afternoon after the management promised a 15 percent pay rise soon and a further 10 percent rise in July, the paper reported. A series of suicides at Taiwan electronics company Foxconn Technology's plant in Shenzhen led to the company increasing wages by 30 per cent. The deaths focused attention on working conditions at the electronics giant whose customers include Dell Inc and Apple Inc.
Police also deployed tear gas to dispel protesters, arresting dozens and injuring several people in Taiyun City, in China's Shanxi Province. The violent protests allegedly erupted over confiscated properties amid government corruption. For more on this story, click here.